Our group aims at uncovering the fine mechanism of micturition control in health and in several disease states and at offering better and safer treatments to patients with lower urinary tracts symptoms, like urinary incontinence or bladder pain. At an experimental level we make use of animal models that mimic diseases as spinal cord lesions, overactive bladder or bladder obstruction due to prostate enlargement. We have studied the importance of neurotrophins and TRP receptors and its endogenous agonists in these processes and in terms of therapeutic possibilities we are making progresses in finding effective TRPV1 and TRPV4 antagonists and clarifying how Botulinum toxin works once injected in the bladder or in the prostate gland. At a clinical level we were involved in a large multicentre clinical trial that demonstrated for the first time the efficacy and safety of Botulinum Toxin type A in the treatment of urinary incontinence due to neurological disorders and defined the ideal dose of this toxin. We also contributed decisively to introduce this toxin in the treatment of chronic bladder pain states. We made substantial progresses in the definition of urinary biomarkers in overactive bladder. We are currently investigating the possibilities of the pharmacological manipulation of the bladder adrenoreceptors for the treatment of this syndrome. Finally we investigated new surgical options for treatment of urinary incontinence in women. 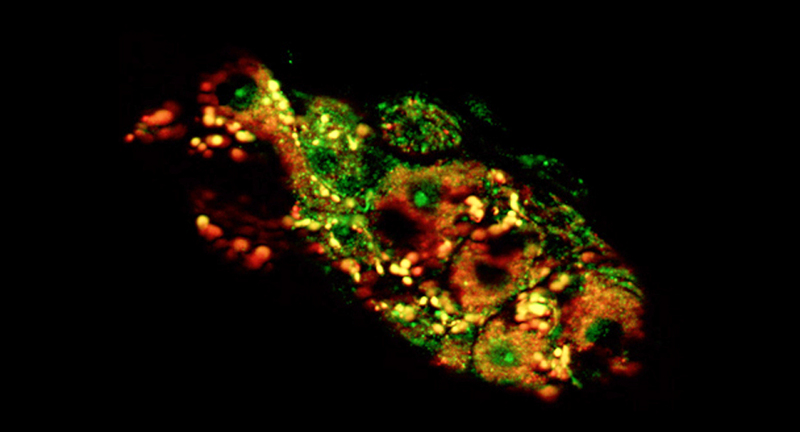 Co-expression of cleaved SNAP-25 (red) with VAChT (green) in a pasympathetic ganglion of the guinea pig bladder following Botulinum toxin injection. The end product of the neurotoxin is localized in cholinergic terminals (yellow).